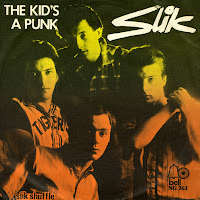 After the UK hits 'Forever and ever' and 'Requiem', Slik tried to make it a hattrick with the song 'The kid's a punk'. Unfortunately, this attempt was unsuccessful: the single flopped. I have to say that buying this single was a gamble: I bought 'Forever and ever' not so long ago and liked that song so I hoped this would be just as nice. It isn't, but the B-side does make up for it: it's very out of style for the band, but a very infectious tune. Slik were formed as the Glasgow band Salvation in 1970. After several personnel changes they changed their name to Slik in 1974. One of the members of the band was Midge Ure, who would achieve great successes when he joined the band Ultravox in the late Seventies. His first success, however, came when Slik released the single 'Forever and ever'. It was a number one hit in the UK in February 1976. Shortly after that, it made number 2 in the Netherlands. I bought my copy yesterday at the 30th edition of the international record fair in Utrecht. It's not a single I've been searching for for years, but I wanted to have it nonetheless.